One of the most discussed products in the detailing process are the products used for paint protection. Synthetic sealants are a common choice because they are typically more durable than a wax, and less expensive than a paint coating. The Sonax Polymer Net Shield is an aerosol based spray on sealant! Net Shield is formulated using organic and inorganic hybrid polymers that once sprayed, immediately react to oxygen and cross-link on your paint. 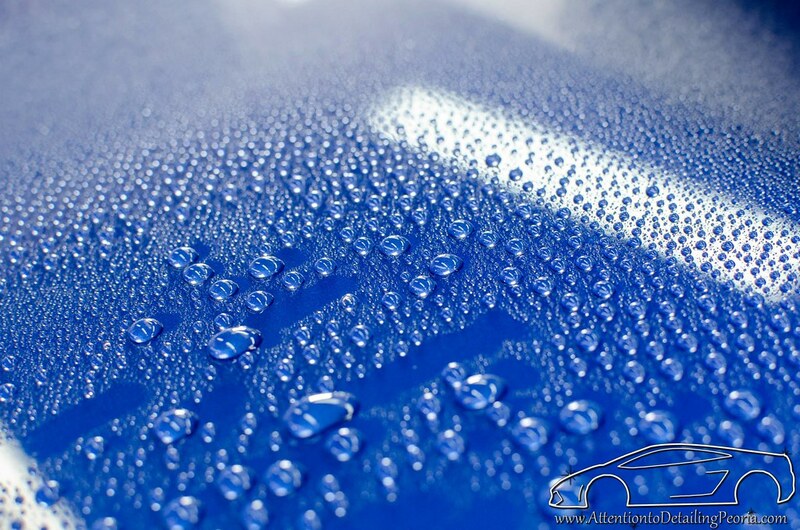 The surface tension created causes water to bead up and roll off, allowing your vehicle to stay cleaner longer. The polymers produce a crisp, clear reflection while protecting your paint from UV rays, acid rain, bird droppings, airborne contamination, road salt and more. If you are looking for a quick and easy way to protect your paint, give the Sonax Polymer Net Shield a try! Sonax Polymer Net Shield (SPNS) is different than other sealants in that it comes in an aerosol can and must be applied by hand (rather than with a machine). The following video shows how easy it is to apply SPNS to your vehicle. First, the product is sprayed on the foam applicator. Be aware of over spray! As you can see, I missed the pad slightly and some of the product ended up directly on the paint. This is not an issue if that is the area you are going to be working on, however you do not want to be spraying the product on an area where it will be left to dry. I would typically spray the product away from the vehicle to avoid over spray. Next, spread the product onto the paint. I prefer to use a cross hatching motion to help ensure even coverage. Then immediately remove with a clean microfiber towel. It is important to work in small areas (approx. 2’x2′) as the product can be difficult to remove, or cause streaking, if you work in larger areas. It does not take much product to cover an area, and you may notice that you don’t have to spray your applicator before each section, as you may have enough product that has soaked into your foam pad to do several small sections before you need to add more product. Try dabbing the applicator on the surface to release some of the product that has soaked into the pad, and then spread it out. Photo: SPNS is becoming known for it’s tremendous beading abilities. It is no myth, this stuff beads water like crazy! Sonax Polymer Net Shield is a product that I have used on several different vehicles now, and I am always pleased with the results. The application may take a little getting used to, however it is not a difficult process and you’ll surely get the hang of it once you’ve worked a couple of sections. SPNS provides good overall protection that helps your vehicle stay cleaner for longer periods of time, and also makes routine washing & drying easier. Due to the awesome hydrophobic properties of this sealant, it is extremely quick and easy to blow the car off with a Master Blaster if you would like to avoid using a towel. If you’re looking for a nice sealant, look no further. Sonax Polymer Net Shield is a great choice! Hey Zach, what applicator is that you’re using? It’s a foam applicator I purchased a while back from another online retailer… I don’t remember what brand it is? Another similar option is the DI Polishing Pal paired with a 4″ finishing pad. looks like good stuff. Quick question – do I have to strip the wax/sealant I currently have on the car, or can I simply apply this after my next wash? Hey Mike, thanks for reading! Since this is a sealant (not a coating) you do not technically have to remove any previous layers of protection before applying. For best durability, however, it is always a good idea to remove existing waxes or sealants before applying a new layer. It sounds like you may have been using too much product. You’ll notice in my video the SPNS wiped away quickly and easily with little pressure, and left no traces of residual product/streaking. Reload, on the other hand, is definitely even easier to apply and remove. I am planning on doing a full review of that product in the near future as it is one of my all time favorites and I use it very, very often! Thanks for reading! Is there a product that gives my client a wet finish. The detailed he had been using in another state makes his car look wet after he picks it up. However it does not last any longer then the first wash but I would like to know if there is a product that can give a care a few days wet look something like a dressing you put on after waxing or washing. It is a black Dodge 2013 truck, Please let me know. Thank You. Hi Larry, a properly detailed vehicle will always produce a deep, wet looking finish. If the surface is dull and full of defects, the paint will need to be properly corrected to level the defects and reveal a deeper, darker looking finish. This enhanced appearance will then last for a long time with proper maintenance. Out of curiosity, can Netshield be applied to UKd chrome wheels? what is the procedure for prep for a new car to apply sealants. Polishing will remove any residual wax that may have been applied previously, but it is not truly needed prior to applying a sealant if you don’t wish to polish. Wash, decontaminate, polish (optional), and apply paint sealant. Note: if you’re going to apply a paint coating, the prep work is more in depth and requires paint correction/polishing as well as surface prep after polishing. Im highly interested in using this product. After applying this sealant after a wash/clay/polish can i also put a layer of wax on top of this sealant ? Im curious just to know in case the customer later down the road wants to apply wax by hand. There is no reason to apply a wax on top of this sealant, but you will not harm the sealant if you wish to do so. I would advise only using Sonax Brilliant Shine Detailer on top for added protection as it behaves very similarly to SPNS. Thank you for the reply! Now would it be good if you use this product after the car is wash/clayed/polished/waxed ? 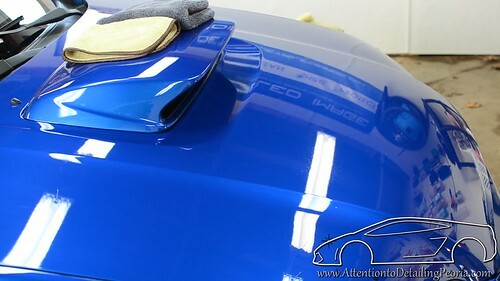 Or skip the wax and go straight to applying this quick detail/sealant ? Hi Raul – this product is a dedicated sealant, and therefore should be applied directly to the clean paint. Do not wax first. Wash, Decontaminate if needed, polish if needed, then apply Sonax Polymer Net Shield. You should easily see 4-6 months of life from this product. Does multiple applications increase protection, durability, or shine? Also, does it hurt to use wax over the top of SPNS? I have not personally tested multiple coats, so I cannot comment on the effects with this particular product. I do not see the benefit in waxing over this product, however I do not think it would hurt anything. 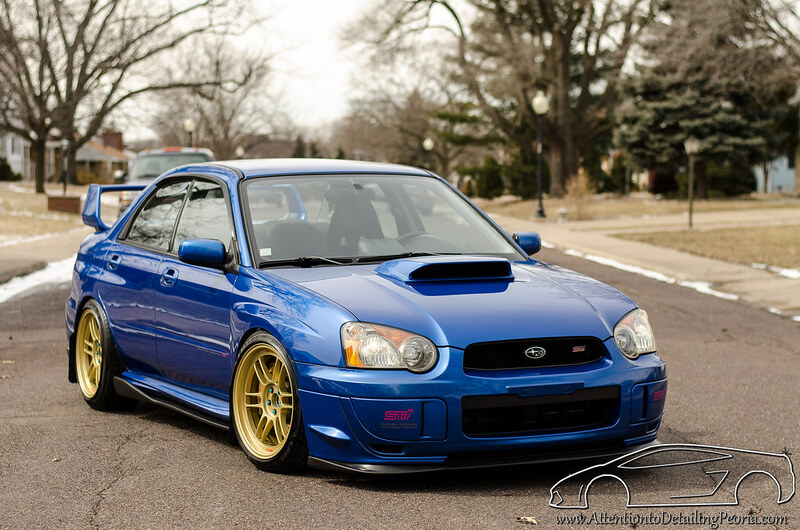 You would just cover up the excellent hydrophobic properties of SPNS with the wax you chose. If you want to apply something over SPNS, I would highly recommend Sonax Brilliant Shine Detailer. I just received this product. I have a 2016 BMW 228ix and detail it with clay bar, M205 and Wet Diamond polymer. I plan to apply this after the polymer. Is there any wait time before applying. Also, can thous product be used on the orbit grey wheels on my BMW. Thanks. Hi Ray – this product would be used instead of BlackFire Wet Diamond. Both BFWD and SPNS are sealants, and SPNS will last longer when applied directly to clean paint. Yes, it can certainly be used on wheels. Thanks for your comments Zach. How would you compare the depth of shine between BFWD and SPNS. Overall appearance is dictated mostly by your abilities with a polisher… what I mean is that a properly polished vehicle that is free of swirls will look outstanding with any type of wax or sealant on it. BFWD provides a slicker feeling layer of protection, while SPNS isn’t slick to the touch. Both look great to me. If you are a fan of water beading, SPNS is going to blow you away. Dear Zack – The PNS label says it does contain silicone. Other products make it a point to state that they contain no silicone. Sonax Brilliant Shine does NOT say it contains silicone. So, what’s the deal with silicone – 1) Will the silicone in PNS potentially interfere with other products applied on top? 2) Will a normal clay bar service completely take off the PNS and silicone? 3) Do I use a specific product to make sure I remove the silicone? I normally clean up the clay lube with CarPro Eraser…will that deal with the silicone? 4) Will the silicone in PNS compromise a good clay bar (Magic Clay). Hi Richard – I am afraid you’re asking questions that I am not qualified to answer with regards to the silicone content of products. I can tell you that a clay bar will not completely remove any form of protection, nor will a wax, sealant, or coating compromise a clay bar. I have used a variety of products on top of SPNS and I have not experienced any issues with spray waxes, quick detail sprays, etc. I would recommend reaching out to Sonax for a more thorough and knowledgeable answer. Will this product work on paint protection film ie 3M/Xpel? Hi Zack! I’ve asked this in a comment on another post of yours on BSD. I have questions regarding the use of Sonax PNS with Sonax BSD. There’s a definite lack of information from Sonax, and what I’ve been able to find on the ‘Net. 1. Do both products use the same base solvent? For example, is BSD water-based? 2. After PNS has been applied, and cured for 24 hours, will the solvent of either product remove this cured coat of PNS? Just to be clear, my question is essentially about layering. If the primary coat of PSN, when fully cured, is *not* desolved by the solvent of a second coat, then layering is possible. (Even if not necessary.). So, that’s why I’m interested in the robustness/resistance of a cured coat of PNS, and how it interacts with whatever solvent is used in either product.